I hadn’t planned on writing about Mother’s Day, but a discussion I heard yesterday made me change my mind. 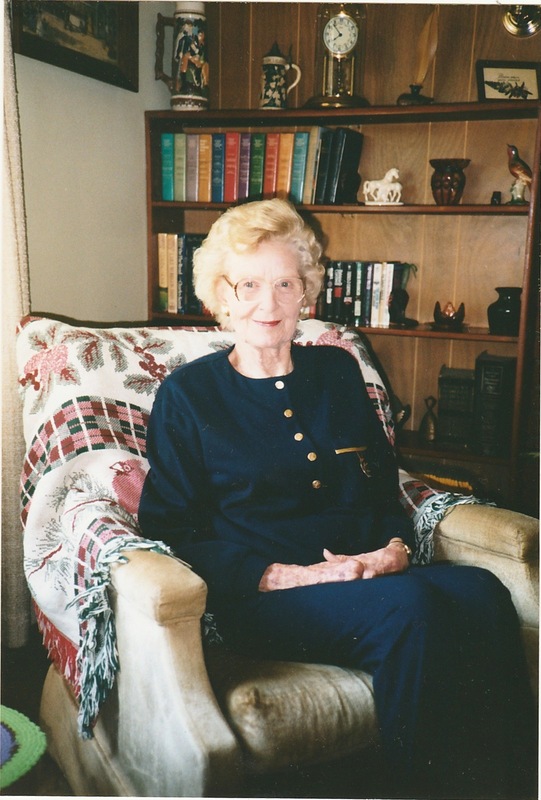 Both my Mother and my Mother-in-law have passed away, and I have been thinking about them. My Mother-in-law was an artist in addition to being the mother of three very charming boys. She loved being near water, either a lake or the ocean. The last years of her life she lived on the California Coast. Before her eyesight failed, she took sailing lessons and painted scenes of the ocean. 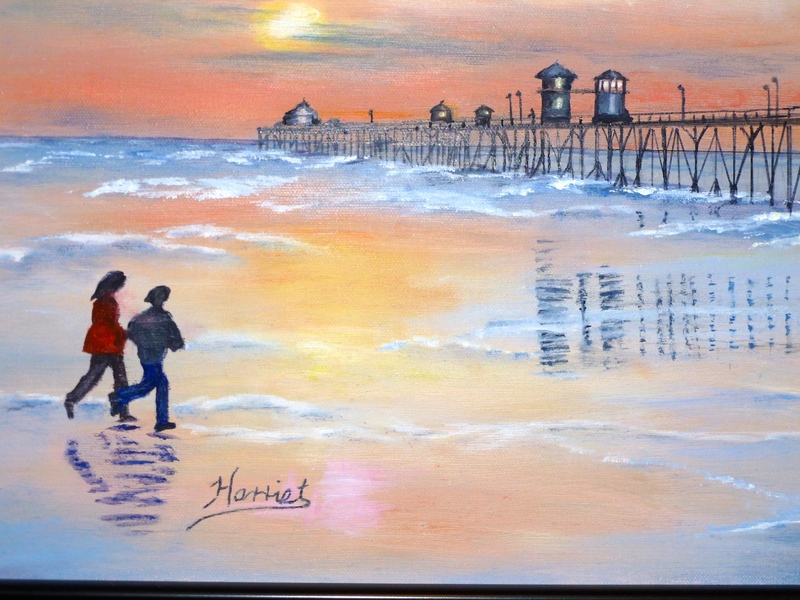 This is one of her paintings; the pier at Oceanside at Sunset. I am fortunate to have this one on the wall in my office. My mother always worked outside the home. In a time when television would have you believe all mothers stayed home and all husbands worked in offices and wore suits, my family did not fit that mold. I know few families who did. When I was in grade school, I always looked forward to Thursday. Thursday was my mother’s day off from work. That meant I could go home for lunch and my mom would drive me to school. I remember being drilled on my times tables as she drove me to school. I also remember the pink plaid dress she made for me when I was eight. My Mom was an excellent seamstress and a wonderful baker. She was a strong, quiet woman. 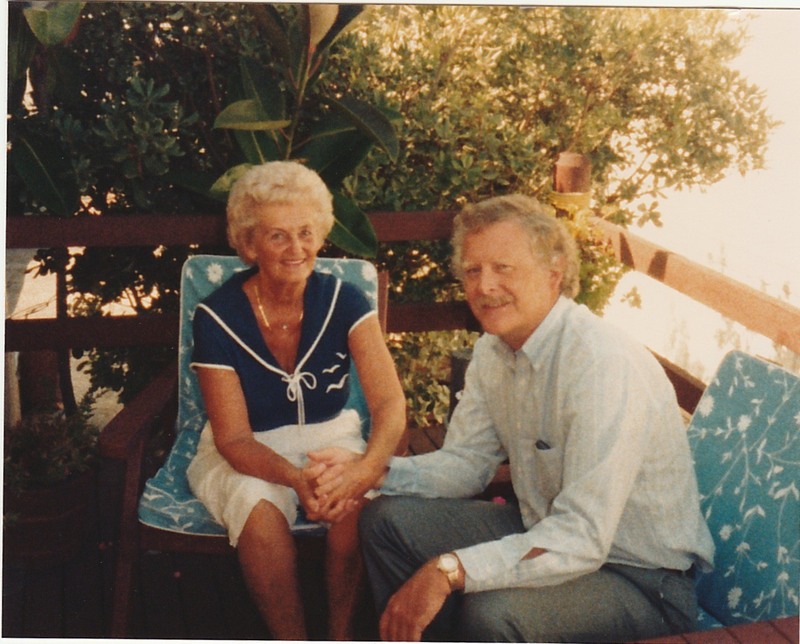 My Mother-in-law with my late husband. I miss them both. Happy Mother’s Day, Moms. I am gobstruck by your offer to nominate me for the Liebster Award. Thank you, and I accept. Next steps? Love the beach painting. Glad you decided to write about Mother’s Day. Glad you like the painting. If you go to my blog and look at the post Liebster Award and Writing 101 there is some information about the award. Also, click on wordingwell.com/the-liebster-award and there is more information. On that page, if you scroll down, you will find a Liebster Award badge that is labeled liebster-award.png that you can copy and print on your website.